Oleg Sofrygin, PhD, is a Biostatistician/Research Scientist I at the Kaiser Permanente Northern California Division of Research. He holds a concurrent appointment as a Postdoctoral Scholar in Biostatistics at the University of California, Berkeley. His work at U.C. Berkeley is supported by the Bill and Melinda Gates Foundation, Healthy Birth, Growth, and Development Knowledge Initiative (HBGDki). Dr. Sofrygin’s research focuses on the development of statistical methods for data-adaptive estimation of causal treatment effects in observational studies. He is interested in developing and disseminating open-source, machine-learning-based statistical software for analyzing longitudinal data. He is currently applying his software skills in the evaluation of the comparative effectiveness of diabetes treatments from large-scale, longitudinal electronic health record data. 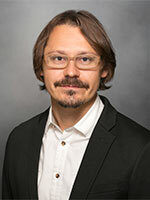 Dr. Sofrygin’s other research interests include high-performance statistical computing, the estimation of causal effects of interventions in network-connected communities, and the design of simulation studies for causal inference. Dr. Sofrygin received his PhD in Biostatistics from the University of California, Berkeley. His dissertation work focused on semi-parametric estimation of causal effects in network-dependent data. J Stat Softw. 2017;81. Epub 2017-10-16. Estimating outcomes and cost effectiveness using a single-arm clinical trial: ofatumumab for double-refractory chronic lymphocytic leukemia. ​Cost Eff Resour Alloc. 2017 May 26;15:8. doi: 10.1186/s12962-017-0071-x. eCollection 2017. Semi-Parametric Estimation and Inference for the Mean Outcome of the Single Time-Point Intervention in a Causally Connected Population. ​J Causal Inference. 2017 Mar;5(1). pii: 20160003. doi: 10.1515/jci-2016-0003. Epub 2016 Nov 29. Long-term outcomes among African-American and white women with breast cancer: what is the impact of comorbidity? Journal of geriatric oncology. 2014 Jul 01;5(3):266-75. Epub 2014-03-05. Technical evaluation of methods for identifying chemotherapy-induced febrile neutropenia in healthcare claims databases. ​BMC Health Serv Res. 2013 Feb 13;13:60. doi: 10.1186/1472-6963-13-60. Cost-effectiveness of lapatinib plus capecitabine in women with HER2+ metastatic breast cancer who have received prior therapy with trastuzumab. ​Eur J Health Econ. 2012 Oct;13(5):589-603. doi: 10.1007/s10198-011-0323-1. Epub 2011 Jun 24. Cost-effectiveness of zoledronic acid plus endocrine therapy in premenopausal women with hormone-responsive early breast cancer. ​Clin Breast Cancer. 2010 Aug 1;10(4):267-74. doi: 10.3816/CBC.2010.n.034. Cost-effectiveness of aliskiren in type 2 diabetes, hypertension, and albuminuria. ​J Am Soc Nephrol. 2009 Oct;20(10):2205-13. doi: 10.1681/ASN.2008111144. Epub 2009 Sep 17. Cost of routine immunization of young children against rotavirus infection with Rotarix versus RotaTeq. ​Vaccine. 2009 Aug 6;27(36):4930-7. doi: 10.1016/j.vaccine.2009.06.025. Epub 2009 Jun 23. ​Eur J Health Econ. 2010 Feb;11(1):35-44. doi: 10.1007/s10198-009-0160-7. Epub 2009 Jun 9. Cost-effectiveness of abatacept in patients with moderately to severely active rheumatoid arthritis and inadequate response to tumor necrosis factor-alpha antagonists. ​J Rheumatol. 2008 Sep;35(9):1745-53. Epub 2008 Jul 15. Cost-effectiveness of abatacept in patients with moderately to severely active rheumatoid arthritis and inadequate response to methotrexate. ​Rheumatology (Oxford). 2008 Apr;47(4):535-41. doi: 10.1093/rheumatology/ken007. Consequences and costs of noncompliance with iron chelation therapy in patients with transfusion-dependent thalassemia: a literature review. Cost-effectiveness of letrozole versus tamoxifen as initial adjuvant therapy in postmenopausal women with hormone-receptor positive early breast cancer from a Canadian perspective. ​Breast Cancer Res Treat. 2008 Apr;108(3):375-87. Epub 2007 Jul 26. Cost-effectiveness of letrozole versus tamoxifen as initial adjuvant therapy in hormone receptor-positive postmenopausal women with early-stage breast cancer. ​Clin Breast Cancer. 2007 Jun;7(8):608-18. Cost effectiveness of once-daily oral chelation therapy with deferasirox versus infusional deferoxamine in transfusion-dependent thalassaemia patients: US healthcare system perspective.